The Faculty of Fundamental Sciences was established to ensure close cooperation among the general departments of BMSTU. The educational programs of the Faculty lead to bachelor’s and master’s degrees in Applied Mathematics, Mathematics and Computer Science, and Technical Physics. The departments provide students with an opportunity to get the second University degree in Applied Mathematics, Technical Physics, or Technical Mechanics. · highly sensitive physical measurements. Graduates holding a degree in technical physics focus on development and application of modern technical devices and processes based on recent developments in physics. They can solve the most challenging problems of synthesizing and predicting both natural and industrial processes, as well as the processes following some phenomena in microstructures. • Thermal Physics &Molecular Physics. 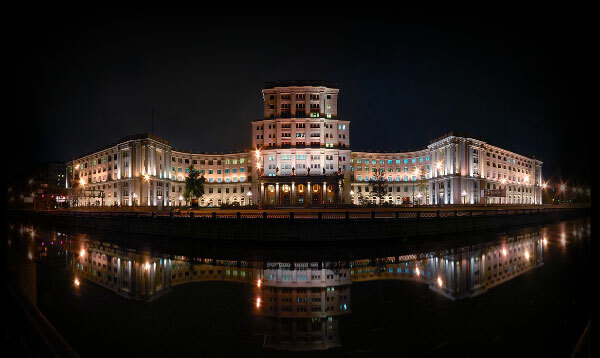 The Department closely interacts with a number of leading institutes of the Russian Academy of Sciences and enterprises: Lebedev Institute of Physics of the Russian Academy of Sciences; the Institute of General Physics of the Russian Academy of Sciences; the Russian National Research Centre “Kurchatov Institute”; the Institute of High Temperatures of the Russian Academy of Sciences; the Institute of Microelectronics and Super-Pure Materials of the Russian Academy of Sciences (in Chernogolovka), The Center for Geoelectromagnetic Research of the Russian Academy of Sciences (in Troitsk), Zverev Krasnogorsk Plant, OJSC (in Krasnogorsk); Ramenskiy Instrument Engineering plant, OJSC (in Ramensk) and others. It also cooperates with industrial R&D institutes and head offices of manufacturing companies on bachelor’s and master’s training program issues. The Department of Physics annually performs a considerable amount of contract work in various fields, which enables it to engage undergraduates and PhD students to carry out such work. The Department focuses on students’ career guidance, which makes it possible for most graduates to get employed successfully according to their qualifications. Mathematical simulation is one of the most promising scientific areas ensuring progress in various technical fields. It is based on the latest achievements in physics, mechanics, chemistry, and other fundamental sciences externalizing them in a rigorous form of mathematical models, which allow conducting simulation experiments with the help of modern computers. The “Model-Algorithm-Program” triad is a tool making it possible to obtain the necessary amount of reliable information on the research object quickly. There are many striking examples of mathematical simulation, which helped find a solution (often, an unexpected one) to the most hard-to-crack scientific and technical problems causing a breakthrough in the development of not only technical fields but also of the disciplines which might appear to be far from the exact sciences, such as biology, economics, and even philology. Mathematical simulation proved to be a universal mean to carry out both scientific research and technical development: from creating rocket and space complexes comprising the most recent scientific and engineering achievements to the decoding of the nucleic acid molecule genetic code. The Department of Applied Mathematics combines not only acquisition of practical professional knowledge, skills and expertise necessary for conducting science-intensive research and developments, but also obtaining a fundamental education, which gives graduates the opportunity to master their skills in different scientific and engineering fields. It also enables bachelors and masters in applied mathematics to get better adapted to the ever-changing and hardly foreseeable situation in the industrial and scientific spheres, as well as in economy in general. • Supercomputer Simulation in Engineering. • Information Science, Programming, and Computer Engineering. During their course of study, the students acquire knowledge in such disciplines as mathematical analysis, algebra, ordinary differential equations, multiple integrals and series, discrete mathematics, differential geometry and tensor calculus, mathematical physics equations, probability theory, continuum mechanics, C++ basic programming, databases, operating systems, and many others. Our graduates’ distinctive feature is their ability to develop applied software programs for mathematical simulation of complex systems both individually and through teamwork in such fields as computer-aided design and modelling of space rocket hardware; aero- and gas dynamics; thermal physics; thermal strength; material, composite, and nanostructure science; remote probing and mathematic processing of information; processing of mineral prospecting data; reliability and lifetime of unique thermal power generation equipment, etc. The graduates are highly valued by employers for combining three main features: deep mathematical knowledge, capability to develop software programs for using mathematical models, and work experience in creating applied software programs.